This article is about the year 6000 in the Hebrew calendar. For the Gregorian year 6000, see 7th millennium. Universal peace is a main theme of the Messianic Age. 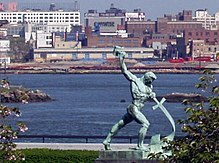 Let Us Beat Swords into Plowshares sculpture, by Evgeniy Vuchetich, United Nations Art Collection. According to classical Jewish sources, the Hebrew year 6000 (from sunset of 29 September 2239 until nightfall of 16 September 2240 on the Gregorian calendar) marks the latest time for the initiation of the Messianic Age. The Talmud, Midrash, and the Kabbalistic work, the Zohar, state that the 'deadline' by which the Messiah must appear is 6,000 years from creation. According to tradition, the Hebrew calendar started at the time of Creation, placed at 3761 BC. The current (2018/2019) Hebrew year is 5779. The belief that the seventh millennium will correspond to the Messianic Age is founded upon a universalized application of the concept of Shabbat—the 7th day of the week—the sanctified 'day of rest'. This tradition maintains that each day of the week corresponds to one thousand years of creation: Just as the six days of the workweek culminate in the sanctified seventh day of Shabbat, so too will the six millennia of creation culminate in the sanctified seventh millennium (Hebrew years 6000–7000) — the Messianic Age. Just as Shabbat is the sanctified 'day of rest' and peace, a time representing joyful satisfaction with the labors completed within the previous 6 days, so too the seventh millennium will correspond to a universal 'day of rest' and peace, a time of 'completeness' of the 'work' performed in the previous six millennia. The Talmud also draws parallels between the Shmita (Sabbatical) year and the seventh millennium: For six 'years', or millennia, the earth will be worked, whilst during the seventh 'year', or millennium, the world will remain 'fallow', in a state of 'rest' and universal peace. The reconciliation between the traditional Judaic age of the world and the current scientifically derived age of the world is beyond the scope of this article, with some taking a literal approach, as with Young Earth creationism, and others, such as Gerald Schroeder, a scientific conciliatory approach. Six eons for going in and coming out, for war and peace. The seventh eon is entirely Shabbat and rest for life everlasting. In the 600th year of the sixth thousand, the gates of wisdom on high and the wellsprings of lower wisdom will be opened. This will prepare the world to enter the seventh thousand, just as man prepares himself toward sunset on Friday for the Sabbath. The redemption of Israel will come about through the mystic force of the letter “Vav” [which has the numerical value of six], namely, in the sixth millennium…. Happy are those who will be left alive at the end of the sixth millennium to enter the Shabbat, which is the seventh millennium; for that is a day set apart for the Holy One on which to effect the union of new souls with old souls in the world (Zohar, Vayera 119a). There is a kabbalistic tradition that maintains that each of the seven days of creation in Genesis chapter one corresponds to one millennium of the existence of natural creation. The tradition teaches that the seventh day of the week, the Sabbath day of rest, corresponds to the seventh millennium, the age of universal 'rest' - the Messianic Era. Elaborating on the theme of the seventh millennium representing the Messianic Age are numerous early and late Jewish scholars, including Rashi, the Ramban, Chaim Vital, Isaac Abrabanel, Abraham Ibn Ezra, Rabbeinu Bachya, Rabbi Yaakov Culi author of Me'am Lo'ez,  the Vilna Gaon, the Lubavitcher Rebbe, the Ramchal, and Aryeh Kaplan. The acceptance of the idea of the seventh millennium representing the Messianic Age across the Ashkenazi - Sephardi divide, the Chassidim - Misnagdim divide, and across the rational Talmud and mystical Kabbalah perspectives, shows the centrality of this idea in traditional Judaism. In his Sha'ar Hagmul, Ramban writes that the sixth millennium will see the advent of the Messiah and the seventh millennium will be the Shabbat of the 'World to Come', wherein the righteous will be resurrected and rejoice. Ramban further writes that the Scriptural verse, “And God blessed the seventh day and sanctified it” (Gen. 2:3), refers to His blessing the World to Come which begins at the seventh millennium. In his commentary to Genesis 2:3, Rabbeinu Bachya writes that the seventh millennium will follow the Messiah and the resurrection, and will be a time of “great eternal delight” for those who merit resurrection. This being the case, he explains, just as one prepares during the six days of the week for the Shabbat, so too one should prepare during the six thousand years for the seventh. Chaim Vital writes that whoever wants to know what will happen in the end days, should study the first seven days of creation. Each day of creation represents 1000 years, and the seventh 'day', beginning in the year 6000, represents the day of rest. Don Isaac Abrabanel writes that similar to the structure of the week of Creation, so too the world will exist for six thousand years, with the seventh millennium being a Hefsek (break) and a Shvita (rest), like Shabbat, Shmita, and Yovel. Each day of Creation alludes to a thousand years of our existence, and every little detail that occurred on these days will have its corresponding event happen at the proportionate time during its millennium. The עִקְּבוֹת מְשִׁיחַ (iqvot Meshiaḥ), footsteps of Messiah, began the first hour of Friday morning in the Sixth Millennium, that is the year Five Hundred [ from nightfall of October 4, 1739 AD until nightfall of September 22, 1740 AD ], and from hour to hour the footsteps have continued to progress from many aspects [cf. M Avot 1:1; BT Sanhedrin 38a]. As is known, every hour consists of forty-one years and eight months [alt., 41.666], counting from the time that the bonds on the Messiah’s heels were loosened, as it says, You have loosened my bonds (Psalms 116:16), and as revealed in: A decree He declared it for Joseph… ‘I delivered his shoulder from the burden his palms were loosed from the hod’ (Psalms 81:6-7). Beginning with the second hour [i.e., from 5541 (1781 AD)], the entire House of Israel took the stage, both as a whole, and with regard to each individual member of the nation, as an order from above, of Messiah of the beginning of redemption, namely, Messiah Son of Joseph. The Ramchal explains that the Shabbat Millennium will be a time of rest, which will be merited by the righteous. The Lubavitcher Rebbe Menachem Mendel Schneerson explains that upon having reached the Hebrew year 5750 (1989 CE), the millennial 'time-clock' had reached the time of the 'eve' of Shabbat. This is based on the teaching of the Talmud, which states that one thousand human years is equivalent to one 'day' in the eyes of the Creator, which in turn is based upon the verse in Psalms, "For one thousand years in Your eyes are but a day that has passed (Psalms 90:4)". Therefore, given that one human-time millennium is equal to one cosmic 'day', the human-time seventh millennium is equivalent to the seventh cosmic 'day', the 'Shabbat', the Messianic age. Given that the Jewish day begins at nightfall, the year 5750 represented 12:00pm midday on the millennial 'Friday', as per the table below. The Lubavitcher Rebbe, as others, maintains that the Messiah must arrive at, or before, the onset of the Shabbat, the year 6000. The English year 2019, corresponding to the Hebrew year 5779, thus marks 12:41pm on the Millennial Friday. In Jewish law, a half-hour past midday or mincha gedola marks the time on Friday afternoon when the influence of Shabbat begins, and some authorities forbid keeping a business open past that point. Never before has mankind been faced with such a wide range of possibilities. Never before has it had such tremendous power at its disposal, to use for good or evil... We need not belabor the point, but the past hundred years or so have brought about an increase in knowledge unsurpassed in all human history... The ultimate goal of the historic process is the perfection of society... is what we call the Messianic Age... Almost 2000 years ago, the Zohar predicted, "In the 600th year of the sixth thousand, the gates of wisdom on high and the wellsprings of lower wisdom will be opened. This will prepare the world to enter the seventh thousand, just as man prepares himself toward sunset on Friday for the Sabbath. It is the same here. And a mnemonic for this is (Gen 7:11), 'In the 600th year... all the foundations of the great deep were split'. Here we see a clear prediction that in the Jewish year 5600 (or 1840), the wellsprings of lower wisdom would be opened and there would be a sudden expansion of secular knowledge. Listen carefully, friends, to what I'm telling you. Hashem, Elokei Yisrael, created this world that we are living in today in six days. We know that the final redemption, the final Geula, it's going to be like when you left Egypt – only one-fifth of our people left Egypt. Four-fifths perished... during the plague of darkness. So I'm appealing to every Jew. Every negative prophecy can be changed. We can bring Mashiach today. Right now, we are living in a period called Erev [eve of] Shabbat. Let's bring Shabbos early, and let us to bring Shabbos with menucha [ease], with shalom [peace], with simchah [happiness] – Is it possible? Absolutely?! Every negative prophecy can be changed. ^ "Hebrew Date Converter - 1st of Tishrei, 6000 | Hebcal Jewish Calendar". www.hebcal.com. Retrieved 2018-01-04. ^ "Hebrew Date Converter - 29th of Elul, 6000 | Hebcal Jewish Calendar". www.hebcal.com. Retrieved 2018-01-04. ^ a b Pirke De Rabbi Eliezer, Gerald Friedlander, Sepher-Hermon Press, New York, 1981, p. 141. ^ Rabbi Hillel Rivlin of Shklov in the name of the Gaon of Vilna. Voice of the Turtle Dove 1:4.